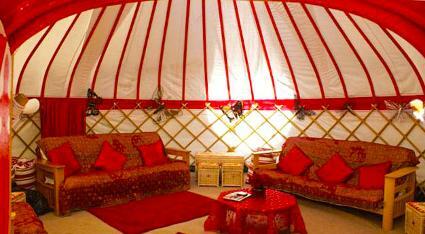 One large Yurt (22 ft across) A large barn with log burner, A traditional authentic Gypsy caravan, A log cabin with bathroom, kitchen, and separate toilet. Fire Pit, Log store. the site also has a large outside grassed area. The site is exclusive, we only take one booking at a time and it is set in the countryside, adjacent to a canal and fields.